At only four days, my time in Leon was regrettably short. Latina Hostel had quickly become my traveling home, while the streets of Leon rapidly became my regular stomping ground. Though Leon is the second largest city in Nicaragua, it has a small town feel that's entirely different from the big city attitude of Managua. 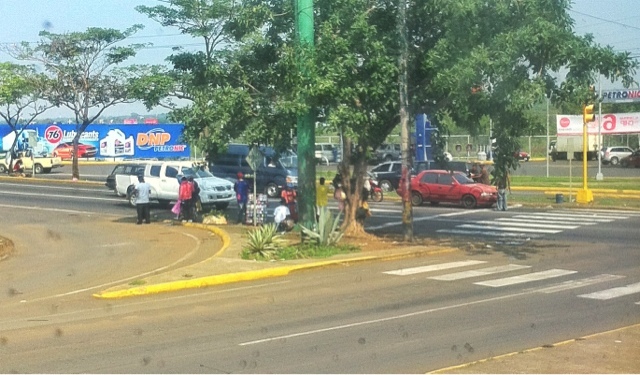 In Managua, the presence of the police are noticeable. Whereas in Leon, I never caught sight of them. A couple high rises, mostly - if not all - hotels, punctuate the Managua sky, while nothing but clouds and sun remained the sole occupants of Leon's. Traffic lights and stop signs are more diligently obeyed in the capital city, with honking the preferred alternative traffic control system in Leon. Overall, Nicaragua has been a welcoming country that is on the cusp of a tourism boom. On my flight from Fort Lauderdale to Managua I had sat next to two fellow Americans discussing their trip to Nicaragua. From a Wikipedia entry they had surmised quite quickly that Nicaragua is a dangerous haven of all things bad. In fact, they hypothesized, the reason they paid so much for their driver was because he'll probably have machine guns to protect them. I felt they were premature to pass such characterization on the country, but having not been there myself, I left them to their dwellings. The point being, while there certainly is truth in the information about the dangers of certain countries, it shouldn't be digested in isolation. Reading about other travelers' wonderful and safe experiences from TripAdvisor and lonelyplanet has given me a pre-arrival perspective that no Wikipedia or government advisory can. I went out the same way I came in. 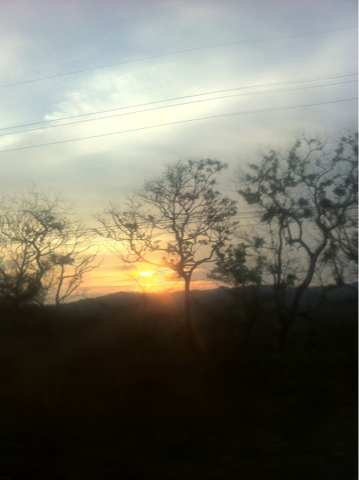 By 9AM, I was standing in line for the next van heading to Managua. It was hot, the line was long, and I estimated I would have to wait for the second van since there were more than enough people ahead of me to fill one up. The woman running the food stand next to me was busily preparing for the day's start. With a broom in hand, she swept away yesterday's garbage, creating a line of debris that traced the periphery of her spot. Women, with baskets of water and other goods delicately balanced on the top of their heads, walked up and down the line with a persistence that would make a car salesman jealous. One gentleman tried to put me in an express bus, another former school bus. I took a quick glance at it and asked myself if I really wanted to spend 90 minutes aboard that uncomfortable vehicle. I quickly said no, and got in line for the van. At last, I was not the only obvious foreigner. Between me and about ten other people, there was the unmistakeable sign of another backpacker. Everyone else appeared to be from Central America, if not Nicaragua. Some had suitcases, others had nothing but a purse. After a 20-30 minute wait, the van arrived and ready to load its Managua bound passengers. As the line rapidly shorten with each passenger disappearing into the van, I heard the driver yelling "Solo! Solo!" Before anyone else could do so, I jumped forward, bypassing ~16 other sweaty passengers with a slight grin in my face. The remaining seat was in the back, but this time, it opened up to the aisle, giving me space to put my backpack. Our fares collected, the van moved forward. We passed through similar environs as the incoming trip, with cattle standing listlessly, farms in various stages of readiness for the rainy season, and homes that humbled me. The bus terminal in Managua was just as I had left it. As soon as I stepped foot out of the van, taxi drivers began their pounce. One tried to carry my backpack, but I pulled it back. 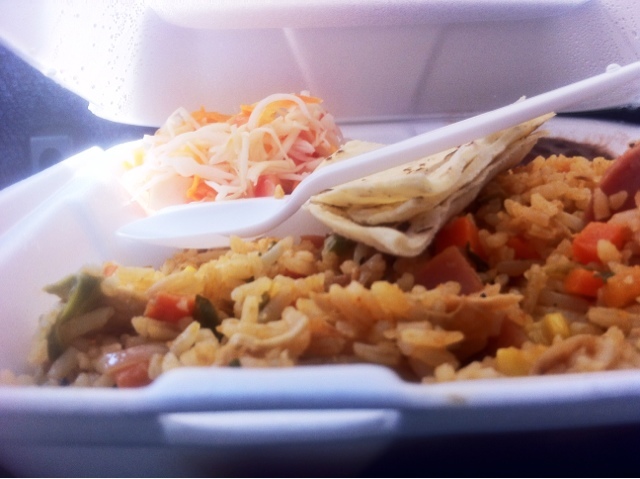 For $4-5, I was soon in a taxi headed for the Tica bus terminal. Situated in a nondescript neighborhood away from the more populated areas, the Tica bus terminal was more reminiscent of what you would see back in the States. Clockwise from the entrance was a small tienda selling snacks, el baño, waiting area, and check-in desk. I checked in, and one of the attendants asked me to take off my backpack. He placed a luggage tag on it and got ready to push it down a ramp leading to the back of the counter. Bewildered, I grabbed it just as it started to slide down. I told him I wanted to take it with me on the bus, but the response I got was "no possible" multiple times. I was resigned to letting my bag go, but not before first taking out my daypack with all my valuables. Since Tica is a reputable bus company, and passengers can only retrieve bags with matching baggage tags, I was less concern about theft and more about mishandling. As I would later find out, the overhead baggage compartment would not had been large enough to fit my bag. Although, the bus wasn't at full capacity so a seat for my backpack wouldn't have been uncalled for. Finally, I got my ticket, and was told my bus would be leaving at 1:30. It was only 11:40. I guess the original 12PM departure wasn't happening. Thirsty and in desperate need of caffeine, I got a bottle of Coke from the tienda. When the woman told me it was twenty Cordobas, I handed her a 50, hoping to get smaller change. Seeing that I had two tens, she instead took out a calculator and typed in 20. I was tempted to type back in 50-20=30, but reluctantly gave her my remaining tens when she continued to refused to take the 50. I made my way to the waiting room. Aided by the ceiling fans, the temperature dropped by half a degree. From there, I had a view of the bus lot. As each bus drove in and dropped off its passengers, a crew of staff came out to wash the front of the bus and sweep away the puddles of water. I've never seen a Greyhound this well taken care of. Then, the waiting game began before I would leave Nicaragua behind. When 1:30 rolled around, I was on the bus. Like the cockpit of a plane, the driver area was sectioned off by a door. On the passenger side was the bus attendant, who came through to provide us our lunch, a large portion of rice mixed with ham and veggies, and refried beans. Two hours late, the bus pushed forward. To our left at a major intersection a car was stopped in the left lane getting what appeared to be an impromptu car wash. I guess stopping traffic for the sake of a clean car isn't as objectionable as it would be in the States. It wasn't long until the cityscape gave way to farmlands. 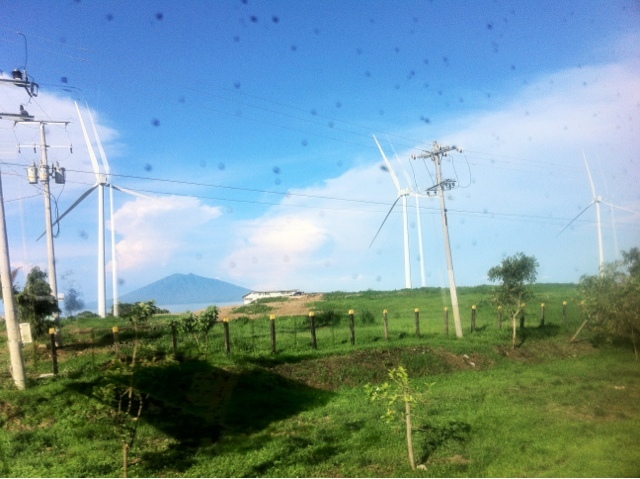 I was surprised to see windmills. Greeting us like silent sentinels in the calm air, the three bladed towers passed us one by one. 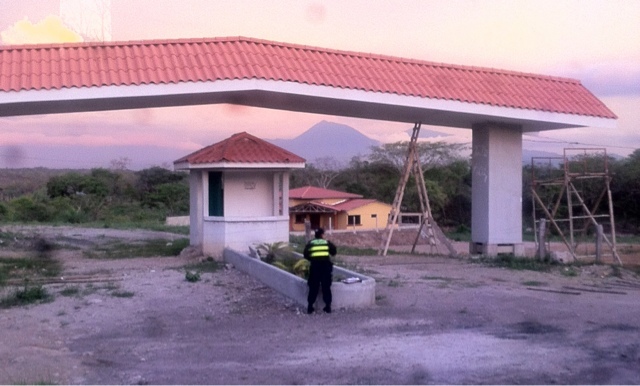 About two and a half hours later, we arrived at the Nicaragua-Costa Rica border. On the Nicaragua side, everyone was asked to get off the bus while the bus attendant took our passports, customs and immigration paperwork, and $3 USD to get processed. Meanwhile, a border patrol inspected the baggage compartment and took a walk through the bus. As we waited, a woman was busily conducting currency exchanges with a couple of the passengers. I decided to wait. Half an hour later, we were back on the bus, crossing officially over to Costa Rica. On the Costa Rica side I must had momentarily blacked out or jumped through the space-time continuum, because all of the sudden a Costa Rican border patrol walked up the aisle and asked me to step off the bus. Confused, I stood up and the sudden stillness and emptiness of the bus startled me. Everyone was gone. Wolfgang tango foxtrot. I quickly got off the bus, made my way through customs - even my backpack was already ahead of me - and eventually went through Costa Rica immigration, which was obscured behind the x-ray machines. The bus, its engine never stopped, lurched forward once we were all back onboard. Within 10 minutes, however, we stopped again. It appeared we had been stopped for a random(?) search. After checking our passports again, the police permitted the bus to continue on. Once the night was upon us, there were no lights, other than those of the bus, to guide us. As oncoming traffic drove by, their headlights were blinding, and not dissimilar to the annoying flashlight of an optomertist. A flash of lightning, followed by a clash of thunder, signaled the beginning of a downpour. The trees outside flew by us, but in the darkness and aided by the lights of oncoming traffic, they looked more like dense patches of fog. Accompanied by the humming of the engine, rattling of the luggage compartment, and pounding of rain drops, the bus slowly and carefully inched forward. By the time we had escaped from under the storm clouds, we had about two hours left to San Jose. 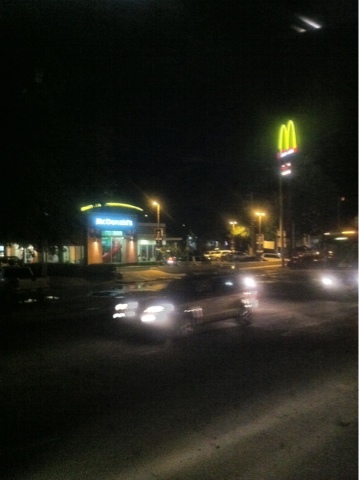 The bus stopped across the street from a McDonald's, the first of many reminders of American capitalism. Unexpectedly, the bus attendant appeared ten minutes later with dinner, courtesy of the Burger King to my right. Not a great start to the Costa Rican cuisine, but I was hungry and had no other alternatives. The burger itself was half the size of a "normal" burger, and was lukewarm, as if it had been sitting waiting for us for a while. 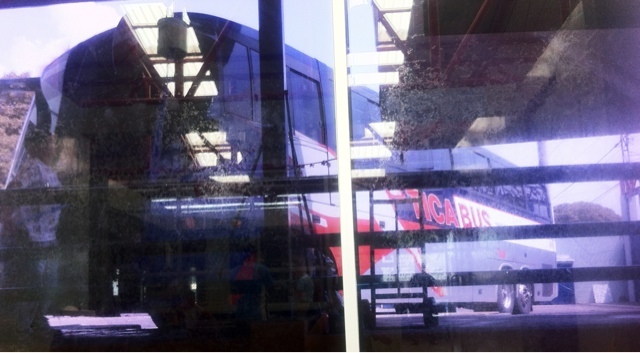 At 10:30, the bus pulled into the gated Tica terminal. Grabbing my bag, I quickly headed out in search of a taxi. It wasn't difficult, as 5-6 of them were ready to go. 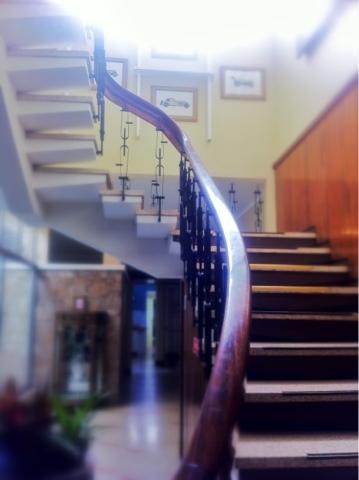 After a quick negotiation, I was on my way to Hostel Casa del Parque. The driver complimented my Spanish, but I insisted it wasn't as good as he thought. The darkness didn't stop him from narrating the landmarks we drove by, and advising me the danger of being out this late at night in the downtown area. The hostel is located directly across a corner of Parque Nacional, which, despite its name that hints of grandeur, was no larger than a block or two, with a couple benches scattered along the walking paths. In front of the hostel was a line of taxis, with yellow triangles and a number on their front doors to designate them as official city taxis.